Published on February 24, 2016 by Martyn. Be the first to comment! 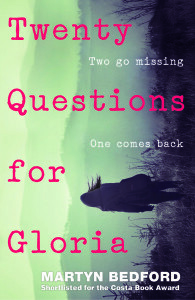 “Aimed at young readers aged 14 and over, this new novel from Martyn Bedford is less high-octane thriller and more a sensitively written, contemplative account of the trials and tribulations of teenage life. Gloria is sick and tired of her mundane life, each day blending into the other, but along comes Uman, this exotic creature whose clothes, vocabulary and general demeanour are unlike anything she’s experienced before. He’s a breath of fresh air, no, make that a hurricane, and Gloria lets herself get swept away without any thought of the consequences. To check out this excellent site please click here.